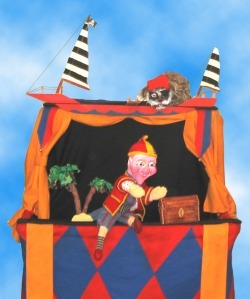 The Puppet Man is a hand puppet presentation done in a very traditional, European style. With the puppeteer (Michael) wearing the walk-around stage, the presentation consists of a variety of humorous skits, sometimes requiring audience members to help out or make suggestions to help the puppets solve problems. This presentation can be geared to few-year-olds or older, elementary aged children. Different themes can often be accomodated. This table top presentation was designed for the Puppets In The Preschool Conference at Contra Costa College, and was created to be developmentally appropriate for preschool audiences. In the story, Little Elephant finds a ball, but when she goes to play with Monkey and Zebra, she discovers that they are much better players than she is and at first would rather play without her. With the prodding of Lion, the animals learn how to play together and appreciate each one's different skills with the ball. This funny and tender show includes live music on the ukelele and singing with children learning the songs and hand plays to join in, as well as helping the animals figure out how to solve their problems. This retelling of the Aesop's fable about the grasshopper and the ant is done in the style of Victorian Paper Theatre, where the characters and scenery are paper art created by Michael Nelson. 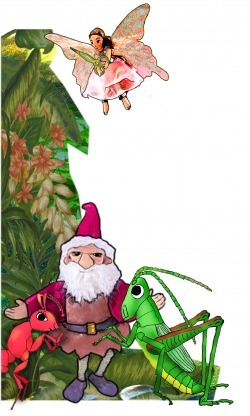 In our telling of the classic tale, the fairies and gnomes help to order the natural world by planting mushrooms or snipping off colorful leaves in the fall. Over the course of one year we follow Gary the grasshopper who learns to make music on grass and practices his playing while his friend Amy the Ant stores up food for the winter, warning him that he had better prepare for winter. When winter finally comes, things look bad for Gary until his musical ability is brought to the attention of the Queen of the Fairies who values his talent and has him play for the Winter festival. With live music on the dulcimore, live singing, beautiful lighting and art work, and ending with a grasshopper limberjack dancing to a tune, this is a cycle show that goes through the seasons with humor and wonder. Best for ages 3 and up.